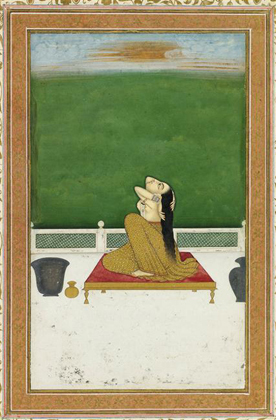 Selected within the MNAAG collections, some 70 of the most beautiful pages of Indian miniatures from the principal painting schools that dazzlingly flourished from the 16th to the 19th century – Mughal School, Schools of Deccan, Rajasthan, and Punjab Hills – highlight a decade of acquisitions that continue to enlarge the rich panorama of Indian painting. An ode to delicacy and refinement. Historic and literary manuscripts, portraits, representations of fauna and flora, court scenes and genre scenes, masterpieces of Persian or Indo-Persian literature, illustrations of the great Epics of Hinduism, personified musical modes (Ragamala), such are the variations of this Indian anthology with its boundless creativity. In 1555, after the Emperor Humayun’s return from exile, a particularly brilliant art of the book blossomed, a result of the work of Hindu or Muslim painters gathered since the reign of Akbar (1556-1605) in a same imperial workshop. Thus came to thrive an exquisitely attentive art dedicated to Nature, love of the picturesque, and a singular sense of space, the first stages of a universal art of the book, addressing the grand themes of the human adventure, illustrating epics and the great history chronicles of the Mughal rulers. Representations of fauna and flora in India form a separate genre in Mughal painting, attested in the late 16th century in the natural history pages of the various manuscripts of the Baburnama, the Memoirs of the Emperor Babur, founder of the Mughal Empire in 1526. Delicate and poetic court portraits, with their highly codified iconography, often show a young prince meditating or reading in a bucolic setting. This archaisising taste for idealised portraits, inspired by very popular Persian models at the beginning of the reign of the Emperor Jahanghir (1605-1627), was relinquished for admirable portraits ruled by a keen realism. Extremely popular with Mughal painters, the theme of the “mystic concert” poetically underscores the highly symbolical associations of ecstatic mystics and inspired musicians, joined in the same exaltation and intoxication of transcendence.